Yet another post that's been a long time in the making*. I didn't want to write a flat boring review of the courses I've done just after I'd done them - you can see what the course contains from the website. But I was amazed by the complete contrast in the two make-up courses I've taken so I thought I should say something about them. When I was looking at university and what to study it never crossed my mind to do make-up. I'm about to be 30 and I think maybe mine is the last generation where the more creative jobs like this just didn't seem to be an option. Unless you showed natural flair in that direction non-academic options weren't really looked into - as a mother I like to think that this has changed somewhat. At a school in Wiltshire my sister was a trailblazer for only applying to London art schools. Now I didn't just wake up one day and decide to be a make-up artist. I'd always worn make-up and been the go-to girl for my friends make-up queries, then I started this blog in 2006 because of my love for make-up (and my ranty inclinations). I kept thinking if only I could do make-up instead of what I was doing. 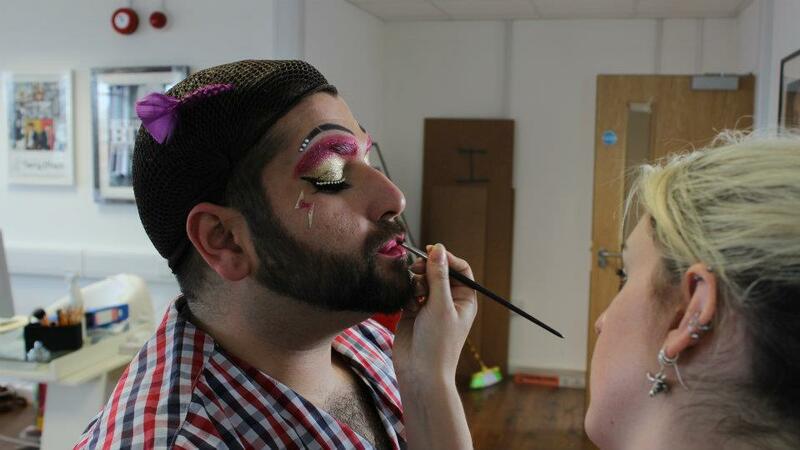 I was pretty confident with make-up, I'd done a lot of friends weddings and parties. So when I finally realised that make-up was a job that no only people did but I could do I was a married dog owner nearly six years into a great job in an industry others were desperate to get into. That meant that I could afford to study because it was my own money but it had to be within the time restraints of holiday from work and not use every penny we had and I'd probably be a bit older than the other people there. I had a mortgage to pay but I have a massive fear of getting old and regretting not doing things so I decided to at least do a course and see how it went. But what course? There are so many options now and evening and weekend terms are widely available for those who work. I decided to go full-time to really immerse myself in it and also to go somewhere that I'd heard of so I chose The Definitive Guide to Make-up Artistry at the London College of Fashion - reasonably priced, photo shoots, 3 weeks. Done. Now the facilities were great - lovely studio, good lighting, lots of space and you get a great starter kit provided for you (even though the brushes are a little crappy) and two photo shoots to kick start your portfolio. But I found that with every day that went by I just felt worse and worse about myself. Resolutely turning up every day in Joe's shirts so I could get all messy with the make-up when most others looked like they were the models, I was also in the 'older' group (I was 27) and the 'younger' group were unreservedly bitchy. Fine. To be expected I suppose, you really can't help who you have on a course. But the teaching I found really difficult. We were constantly made to feel like we weren't and never would be good enough. When asked what the last magazine we bought was the only answer they approved of was Vogue (which was clearly a lie!) - I love Vogue but to imply that unless you read it you can't be interested in make-up is ridiculous. The teacher demonstrated on a beautiful 22 year old porcelain skinned model while we used each other - all different ages with every skin tone and type represented. Other teachers came in during the second week and said how we all were so low on confidence. It was also very difficult to get one-on-one time with the teacher or the assistants as they were constantly chatting, doing each others make-up or looking at previous shoots. Rather than leaving feeling ready to start a new career I left questioning every move I made when applying make-up. I felt like I was back at school and not good enough to be in the 'cool group'. I feel bad. Maybe the course was tempered slightly by the death of my father during the last week... I mean, it was already over but he went into hospital three days before the course ended and I felt guilty for being there and not being with him. But that was three days of three weeks! The death of my father tipped me over the edge - I decided enough was enough and I should at least leave my job and work in make-up retail to get some more hands-on experience. Not so! Without sufficient retail experience, I was unable to find a part-time job anywhere. Luckily I was persistent and go lots of bridal work but the lack of confidence was still there. It still is... I'm not sure if it will ever completely go. So I decided I needed to do something else, something more fun, less structured. With normal people. So I went on a one week course with Pixiwoo. Not ideal as I was 16 weeks pregnant at the time and feeling plump and gross but my god what a difference. These girls have a reason to be confident. They have made fantastic careers and businesses from their talents and yet they were relaxed, friendly and inclusive. I don't think anyone in our group felt like they couldn't ask a question or go over anything they found difficult or couldn't understand and although the students ranged from those who'd never done any make-up at all, sisters who lived in different countries, were fans of the girls and wanted to do something together and those of us who had done some work we could all work at our own level. They demoed on each other or one of the students - normal people with normal skin tone and troublesome bits so we learnt how to deal with redness, acne, dry patches. Not that they implied we'd all be future Alex Box's but at no point was I made to feel like I couldn't be. I felt inspired. I'm not saying don't go for a long-term, proper course - you must do what fits with you and if you are young and looking to study make-up as a college or uni course then that's fantastic but I wish that I hadn't thought of time as a factor and had just gone on the Pixiwoo course from the beginning. One thing both courses had in common was to tell us that there are no rules with make-up, it is a creative process where you can use and do whatever you like and yes it's great to have more hands-on time with the make-up but a week of confidence boosting, friendly and incredibly well structured tuition is worth more than an in-depth look into something where the teacher clearly feels they're in an exclusive club you don't have a hope of joining. You'd do much better getting on a good make-up counter and learning there - it's creative, get your hands dirty**.